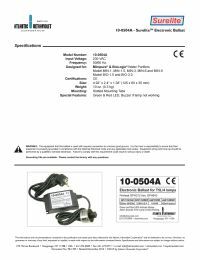 The Atlantic UV 10-0504A 230V 50/60Hz Electronic Ballast is the electronic ballast for T5L/4 Lamps. The 10-0504A comes with an EasyOff Cap, LED Status Indicator Lights, and an alarm which sounds if the lamp is not working. Ballast is for ALL Atlantic UV Mini Pure MIN-1, MIN-1.5, MIN-3, MIN-6, and MIN-9. Note: This ballast does not have an external ground. Grounding kits for this ballast are: 35-7300A or 35-8300A. If grounding kit(s) are not purchased or already installed, customer takes responsibility to insure safe ground is installed.